The Moon? That didn't seem right to Morgan. No one was called 'The.' This is the story of Morgan's quest to learn the name of the Moon. 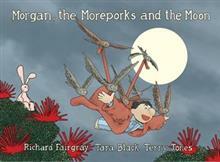 This is Richard Fairgray, Tara Black and Terry Jones' first picture book collaboration.